Dictionary have to be bougth through Apple’s App store. The easiest way is to do it directly from your Iphone device. The dictionary does not require Internet connection. Dictionary have to be bougth through Google´s Android Market. The easiest way is to do it directly from your Android device. 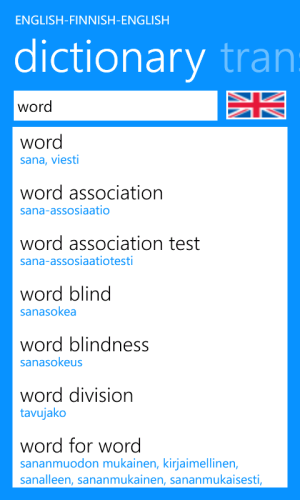 Dictionary have to be bougth through WindowsPhone Marketplace. The easiest way is to do it directly from your WindowsPhone device.